Advanced sensor technology detects where the trainee aims and sweeps our compressed air and water training extinguishers called SmartExtinguishers™. The on-board control system realistically and automatically varies the flames in response and can simulate Class A, B and C fires. When the trainee squeezes the handle of the “smart” training extinguisher, a directional ultrasonic signal is emitted from the tip of the training extinguisher’s nozzle. This signal is picked up by the four sensors on the front of the I.T.S. base unit. The on-board microprocessor control system determines exactly where the user is aiming and sweeping. Variable electronic valves constantly adjust the amount of propane sent to the burners to simulate the fire’s response to the extinguisher. If the trainee aims at the base of the fire, and sweeps the training extinguisher properly, the flames gradually go out. If the trainee does not sweep properly the flames will continue to grow. If the trainee does not sweep all the way across the base of the fire, the flames will not go out. Only the areas of the fire that were hit with the training extinguisher will be extinguished. The different classes of fire respond differently to fire extinguishers. For example, class A fires gradually go out with proper sweeping and class B fires die out quickly but flare up if not extinguished fully. By varying propane flow rate to simulate the different classes of fire, I.T.S. realistically simulates class A, B and C fires. Variables such as the rate of sweeping the extinguisher, where the user is aiming, and the intensity of flames are calculated by the on-board processor, which varies the propane-fueled flames accordingly. 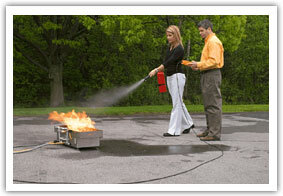 The BullsEye Laser (Indoor Fire Extinguisher Training) represents the latest advancement in fire training technology. BullsEye senses where the user aims and sweeps the laser training extinguisher and automatically varies the LED driven digital flames in response. This allows your trainees to learn how to effectively use a fire extinguisher without the limitations associated with using dry-chemical or CO2 extinguishers. The BullsEye’s electronic control system responds to the trainees’ actions, putting the fire out only when the extinguisher is used correctly.